HOUSTON - Yuli Gurriel was thrown out at third base by catcher Martin Maldonado to end the game after an original safe call was reversed on replay, giving the Los Angeles Angels a 2-0 win over Houston on Monday night that ended the Astros' six-game winning streak. Gurriel singled off Keynan Middleton leading off the ninth inning. Alex Bregman then walked. After a pair of strikeouts, Middleton threw a slider in the dirt to Max Stassi that bounced off Maldonado's leg toward third base. The catcher pounced on the ball and threw to third where Luis Valbuena tagged Gurriel, who slid head first. Umpire Cory Blaser signaled safe. After the replay was shown on the video board, fans started filing out even before the out call was given about 90 seconds after the tag. Middleton earned his sixth save. On Sunday, Blaser called Colorado's Nolan Arenado safe at home plate trying to advance on Brandon Morrow's bases-loaded slider in the dirt at Wrigley Field. That call was then reversed on replay for the final out in the Chicago Cubs 9-7 win. Tyler Skaggs (3-1) allowed four hits in seven innings as Houston struggled to make solid contact against his offspeed pitches. The Astros had outscored the White Sox 27-2 to complete a three-game sweep over the weekend. Skaggs took the mound to warm up at the start of the eighth inning, but Angels manager Mike Scioscia pulled him for hard-throwing reliever Justin Anderson, who made his major league debut. Anderson, a 25-year-old Houston native who played high school ball at nearby St. Pius X, was called up from Triple-A Salt Lake on Monday. 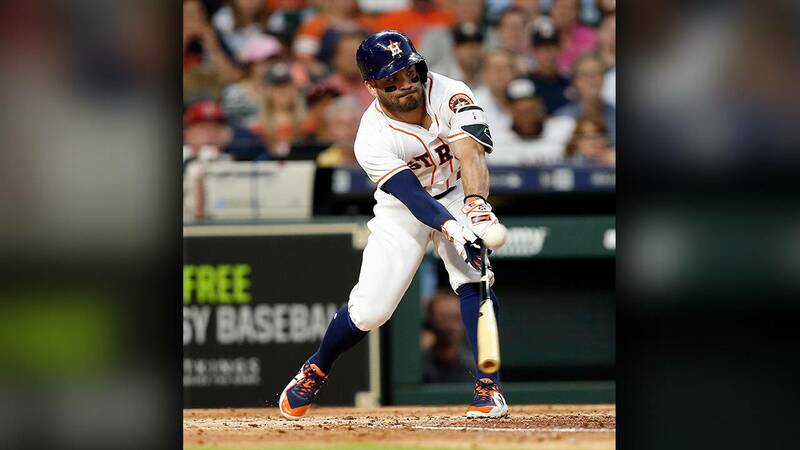 After quickly retiring his first two batters, Anderson allowed back-to-back singles to George Springer and Jose Altuve before striking out Carlos Correa with an 89mph slider to end the eighth. Mike Trout singled in the sixth, stole second and advanced on a wild pitch. He scored on Upton's double to deep center. Angels: SS Andrelton Simmons (forearm) is expected to return to the lineup on Tuesday, Angels manager Mike Scioscia said. Simmons was hit by a pitch in Sunday's game against San Francisco and was held out of Monday's lineup as a precautionary measure.